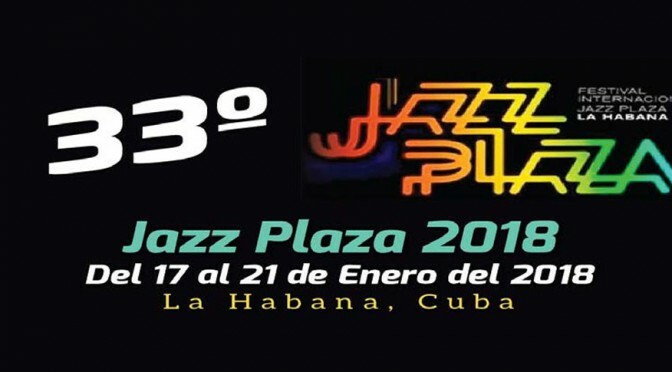 Hello friends, Cubamusic.com shares some of the most interesting proposals of the Jazz Plaza 2018 Festival for the weekend that begins soon (January 19-21). Special jazz days right at the epicenter of this great event. The Jazz Plaza has called this year to great international figures and prestigious players of the courtyard. It opened its doors this January 16 with a special surprise: the teacher Chucho Valdés returned to the presidency of the event. The Jazz Plaza is now in its heyday and adorns with a magic touch the cities of Havana and Santiago de Cuba. We offer some activities that you can still enjoy if you are in any of these two Cuban cities. Enjoyment! -Savel Avellaneda of the National Theater. Havana. Cuba. Concert of the outstanding saxophonist, Joe Lovano, (EU) with the Amadeo Roldán Conservatory Symphony and the young Jazz Band directed by maestro Joaquín Betancourt, invited by César López and Alejandro Falcón. -Sala Covarrubias of the National Theater. Havana. Cuba. Concert of the Aragón Orchestra and Michel Herrera invited Orlando Valle "Maraca", Alain Pérez, El Noro and young jazz players. -Casa de la Cultura de Plaza. Havana. Cuba. Alain Pérez among other guests. -Sala Estorino of the Ministry of Culture. Havana. Cuba. -Jardines del Mella. Havana. Cuba. -Pabellón Cuba. Central scenario. Havana. Cuba. Cuarteto de Saxofones de Santiago. -Hotel Copacabana Belive. Havana. Cuba. -Teatro Martí. Santiago de Cuba. Cuba. -Patio of the UNEAC Santiago de Cuba. Cuba. Iris Jazz. Santiago de Cuba. Cuba. Mundo Buena Vista Social Club concert. Emilio Morales and his new friends. Elito Revé and his Charangón. -Pabellón Cuba. Pergola. Havana. Cuba. -Portal Cine Yara. Havana Cuba. -Sala Dolores. Santiago de Cuba. Cuba. Concierto de Cossette Justo Valdés in homage to the beginnings of symphonic jazz. Leonard Bernstein on the 100th anniversary of his birth. Guests Mayquel González and Jorge Luis Pacheco. Closing Gala with the presentation of Roberto Fonseca, X Alfonso and the first dancer Carlos Acosta, guests Carlos Alfonso and Ele Valdés. Septeto Santiaguero. Havana from 1st. -Entrance by 23. Jazz Band. Jazz Band of the Amadeo Roldán Conservatory. -Pabellón Cuba. The compass. Havana Cuba.